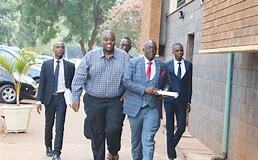 The trial of businessman Wicknell Chivayo who allegedly transferred $10 000 into former Zimbabwe Power Company chairperson Stanley Kazhanje’s bank account, ostensibly to influence him not to cancel a 100MW solar project tender awarded to his company, Intratrek Zimbabwe, yesterday hit a snag after his lawyer failed to attend court as he was committed at the High Court. Mrs Mungwari deferred the matter to April 15 for trial commencement. It is the State’s case that sometime in 2013, ZPC called for bids for the construction of the Gwanda Solar Project plant and Chivayo’s firm applied. Chivayo, on January 21, 2016 allegedly transferred $10 000 from Intratrek Zimbabwe’s bank account into Kazhanje’s personal Barclays Bank account.